Thanks for this lead; I might have completely missed this book otherwise. I'm pretty familiar with the standard presentation of the "other side" (the analytic-scientific study of Scripture) of this story, so I'm very much looking forward to seeing the authors' take on this. Amazon lists it as pre-release Sept. 1. We are clearly past that date, so 'any day now' seemed appropriate. some caution is always advisable when approaching such works. "Biblical literacy" may have more to do with the views of 19th century US Protestant sects than about where Catholics need to proceed in the 21st century. "caveat emptor". I have read the last comment by Daniel McNamara and I'm rather confused. Is it a call for censorship?. For a return to the Index?. Can we catholics, in the XXI century talk of "protestant sects"?. I thought that expression was derisive, and that "separated brethren" was prefered. I certainly did not employ the term "Protestant sects" as derisive. In speaking about the 19th century here in the US, it is common to speak about individual Protestant denominations breaking up, often over issues including "Biblical interpretation". "Sect" indicates an internal division; nothing more. My comment was not a call for "censorship". What struck me was that the language which Tim quoted from this book's "marketing blurb" reflects much of the language and idiom I know from fundamentalist, evangelical academics. It is certainly noteworthy that it is now being used to promote a book to Roman Catholics. This, of course, may be the perspective of the person who wrote the "blurb". But it is interesting the Crossroad's marketing people would do so. They seem to assume it would be effective. And they're probably right! In the wider picture, what I have noticed in recent years is that much of the language, concepts, and emphases in "Catholic Bible Studies" works is "borrowed" from fundamentalist, evangelical biblical studies. That is also noteworthy. That is not to say there is anything wrong with such works. It is only to recognize that we are now "importing" parts of a conceptual framework which may not be as wholly compatible with our Catholic traditions and theology as seems to be assumed. At least WE SHOULD NOT BORROW BLINDLY OR UNCRITICALLY. 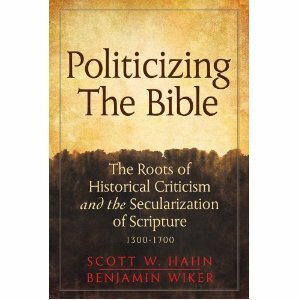 My point above was that, if we are "unhappy" with the views of "liberal Protestant" Biblical Studies over the last 200 years, it does not follow that we are better served by the views of "fundamentalist evangelical Biblical Studies". As things go, likely in another 20 years or so, Catholic Biblical studies will come to feel, "Well, that ain't just it either". Bottom line: read all of them...BUT CRITICALLY. One of the things we are "separated" over involves the Scriptures. Now isn't that odd that a book written by two Catholics should be marketed in this way. I am very sure that there are many valid criticisms to be made about "Historical Criticism". I am not sure what these faults really have to do with Machiavelli. But I look forward to finding out. That part of the "hook" worked on me. Like many, however, a $50 book is "not in the budget" at present. Maybe Crossroads would let me write a review. For those wondering where the term "biblical literacy" comes from, just run it in any search engine. I hope this book does well and that we can all discuss it again later after we can actually read it. I agree that everything should be read critically. But -at least in my spanish speaking milieu- when one makes the slightest critical reading of "modern exegisis" (even using basic common sense) one is immediately met with the accusation of Fundamentalism. And regarding this particular book -who nobody in this site has read yet- you imply that it might have Fundamentalist leanings, with no much hard evidence to back your claim (but for the language in the publicity). "The common practice today is to measure the Bible against the so-called modern worldview, whose fundamental dogma is that God cannot act in history – that everything to do with God is to be relegated to the domain of subjectivity. And so the Bible no longer speaks of God, the living God; no, now we alone speak and decide what God can do and what we will and should do. And the Antichrist, with an air of scholarly excellence, tells us that any exegisis that reads the Bible from the perspective of faith in the living God, in order to listen to what God has to say, is fundamentalism; he wants to convince us that only his kind of exegisis, the supposedly purely scientific kind, in which God says nothing and has nothing to say, is able to keep abreast of the times." (1) Avoid being dragged into abstract philosophical arguments about the relative merits of either approach. Instead, keep your responses simple and focused. Argue as follows. (2) "With respect to this specific issue"(whatever it is), I am trying to FIND WHAT IS IMPORTANT HERE". (3) "The approach of "x" does not seem to help me to find what is important here. Rather, that approach seems to actively work against US in the task of finding what is important here." (4)"However, in this case, the approach of "y" seems to help US far better to find what is important here. (5)"So, in this case, doesn't it make more sense for US to 'go with "y" ?". JAvier, the wise interpreter is like the good carpenter. He/she doesn't have just "one saw". He/she has five or more saws. And he uses the one that best helps him to "do the job". Usually, he uses 2 or 3 saws "as needed" to complete the job , or for different parts of the job. He/she isn't interested in the "label" that others might give to his saw. He/she is "focused on the actual task". Our task, Javier, really is to "find what is important".And in doing so, we like the carpenter reserve the right to use whatever "saw" or "saws" might help us to do that. Arguing about "labels" often obscures this important consideration. Javier, don't let them drag you away from the "what is important here" focus. Yes, there are differences in biblical interpretation and for Roman Catholics. But that for another time, perhaps. Let's get back to the focus of this new book and other considerations. Well, for one, I support a return to the Index, for all the good it would do, now that presses (and the Internet) are not controlled by the Church. It's quite a large book and a brief glance seems to indicate that it will be quite engaging. I am looking forward to wrestling with its thesis. Ah yes, almost a year later huh? I'd love to hear what you think about it once you read it. I afraid I don't have much time to add another book to my list at this point.